Responses of species to landscape modifications are generally documented through their distribution at a given time along an intensity gradient of land transformation. By focusing on patterns, we are limited to infer ecological processes occurring within a system and its response to environmental disturbances which can further change over time. Using diachronic datasets at the scale of France, we analyzed the spatial responses of the black-billed magpie, which has recently colonized cities, to landscape urbanization. This study applied recently developed statistical approaches incorporating detection uncertainty of the magpie, based on the capture-recapture statistical framework. We tested whether, and how, extinction and colonization mechanisms influenced variations of magpie occupancy from 2001 to 2005. In addition, we assessed the importance of the recent urbanization of the French countryside in determining population dynamics. Overall, our analysis proved that the proportion of urban areas and recent urbanization in France led to an increase in the probability of magpie occupancy. Unexpectedly, the species is concomitantly disappearing from the countryside, leading to a rapid change in the distribution of the species. This study stressed the importance of incorporating detection uncertainty in inference process about spatial dynamics. 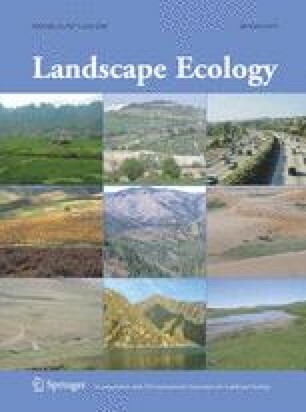 Overall, we show how useful it is to account for the dynamic evolution of the landscape in ecological studies. We sincerely thank the hundreds of volunteers who took part in the national breeding bird survey to whom this paper is dedicated (STOC EPS program). This work was supported by the French ministry in charge of the environment, the Muséum National d’Histoire Naturelle, the Institut National de Recherches Agronomiques, and the Centre National pour la Recherche Scientifique. We thank Andrews Bull for improving the English translation and are grateful to anonymous referees and Vincent Devictor for comments and suggestions that greatly improved the manuscript.